Welding seems like a fairly simple manufacturing process: Line up two pieces of metal, melt them, repeat. And indeed, that can be the case. But at EB Industries, our customers generally expect more from us. Specifically, they often come to us when they’ve worked up an innovative product and they’ve hit a roadblock. It can be a limitation of the materials involved, or a difficult joint configuration, or combination of the two, and suddenly something as seemingly minor as welding becomes a make or break aspect of the product’s design. Truthfully, this is where our staff is at its best: Solving a client’s problem through collaboration, iteration, experience, and plain old engineering. This article details a recent collaboration we had with a customer who manufactures Lithium Ion battery packs for the automotive industry. This is not the toughest challenge we’ve dealt with, but it was extremely satisfying, and hopefully interesting and instructive. Early in 2016, we were approached by a customer running into problem welding copper to nickel. This customer makes Lithium-Ion battery packs for automotive and trucking applications. From an energy storage perspective, Li-Ion batteries work very well. However, they are not without challenges. If a single cell in a multi-cell Li-Ion battery overheats it starts drawing power from other Li-Ion cells it is connected to, which causes more overheating, which in turn causes more power draw, yet more overheating, and eventually ends in fire or an explosion. This is called Thermal Runaway, and obviously it can be a big issue – recall when early Tesla cars caught on fire, or two years ago when certain Samsung phones had to be pulled from the market. Our customer’s battery pack was destined for use in an electric delivery truck designed to stop, wait and go frequently. This duty cycle, involving frequent high current discharges, is exactly the sort of thing that leads to thermal runaway. However, our customer solved the problem with a cleverly designed nickel bus bar. The bus bar was precisely cut and shaped to a tight tolerance where it connects to an individual cell. In the event of an excessive electrical load, this area of the bus bar melts and breaks away, exactly like an old fashion screw-in fuse in a house, disconnecting the overloaded cell from the array and preventing thermal runaway. In essence, the bus bar had an integrated fuse. They designed the main cell pack bus bar out of laser cut nickel. 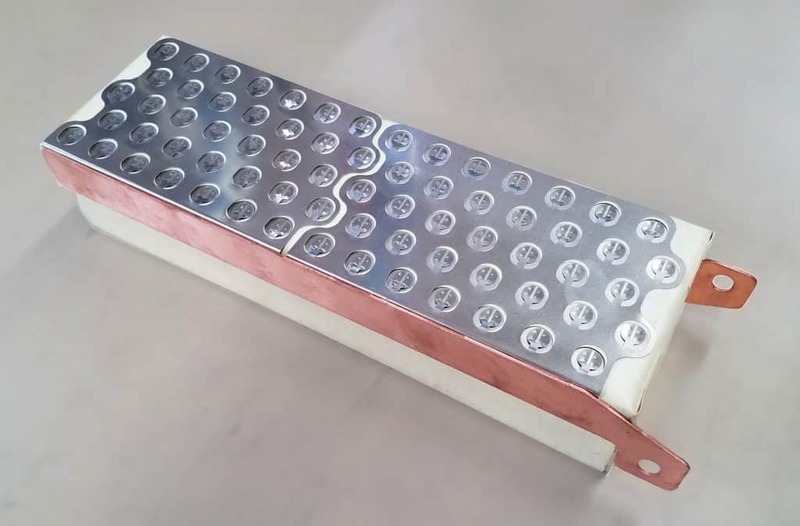 Nickel was the material of choice since the terminals of Li-Ion cells are also made of nickel, and it is easy to ultrasonically weld nickel to nickel, a standard practice in the battery industry. This reduced complexity and cost during assembly of the cell pack. However, nickel did not have sufficient electric and thermal conductivity to carry the maximum load that the delivery truck’s motor would place on the battery array. Just like the fuse area around the individual cell would melt away if one cell put out too much current, the 70 cells in the battery pack had enough power to melt the nickel where it attached to the heavy copper wire leading to the motor. The solution from our customer’s perspective appeared fairly simple: Transition the thin nickel to a heavier copper bus bar, which could then be attached to the main power take-off. By adding copper to the nickel, the current carrying ability of the collector was improved, allowing a higher power output from the cell pack without excessive heat generation, bottle necking or efficiency loss. But the implementation of the solution was far more difficult than the idea behind the solution. First, in any battery application, space is at a premium. The form factor of the battery pack simply did not allow for any mechanical fasteners such as nuts and bolts. Further, the cost of manufacturing and assembling such a design would have been expensive. Ultrasonic welding was another joining process investigated, and while early results looked promising, the ultrasonic welds of nickel to copper were not optimal from a current carrying perspective. More importantly, the ultrasonic welds simply could not hold up physically, as vibratory loading was high. Brazing was tried as well, but the process was labor intensive, expensive, and flux clean-up was also an issue as remnant flux would corrode other components in the battery pack. It became apparent that the seemingly simple weld had the potential to kill the entire project, and this is when our customer actually became our customer. Copper is a difficult metal to weld, especially to materials other than itself. Welding copper requires a very high amount of power applied quickly to a small area. If too much power is applied, or applied too slowly, or across too large an area, the heat travels through the entire part causing significant deformation, warping, and oxidation. Laser Beam Welding (LBW) can apply high power in milliseconds to a precise location, which makes it a viable copper welding solution. However, molten copper forms an almost perfect mirror, which deflects significant amounts of light, and therefore power, away from the weld joint. This reflectivity is why at EB Industries our default process for welding copper is to us Electron Beam Welding (EBW). This process has the precision and power needed to successfully melt copper; more importantly the electron beam is unaffected by the reflectivity of molten copper. However, EBW requires that welding occurs in a vacuum chamber, which wasn’t feasible or cost effective for this application. The bus bar had to be laser welded. Nickel welds nicely with a laser as it isn’t very reflective. However, nickel has a much higher melting point than copper, so welding the two often results in a melted and deformed piece of copper drizzled over the piece of nickel. That or a cold joint that easily separates. The EB Industries solution to welding the copper to the nickel required a bit of engineering and experience. The laser was applied to the nickel side of the joint, as opposed to the copper side, providing sufficient power to melt the nickel but not so much as to overheat the copper. In essence, the copper acted like a heat sink, drawing heat from the weld, thus minimizing potential deformation. Not weld copper to nickel; rather weld nickel to copper. It was a slight difference that, in this project, made all the difference. Once it was apparent the weld could be accomplished, the customer and EB devised a schedule and methodology for completing the parts quickly – the customer had a very short development cycle and tight final product deadline, which meant rapid iteration of prototypes as the manufacturing process was solidified. In six months, our customer produced over 20,000 battery packs utilizing the over 40,000 bus bars we welded. To date there has not been a single battery pack failure in the field. By any measure this was an outstanding success. After the initial 20,000+ piece run, we collaborated further with our customer to improve the design by utilizing a nickel-copper-nickel clad material. The advantages of this material included better thermal and electrical conductivity and lower bulk material cost. Using the new material also eliminated the cost of laser welding the nickel to copper bus bar. But the excellent mechanical and electrical characteristics of the new material didn’t mitigate the basic difficulties of working with copper: Not only is copper hard to weld, it’s also difficult to cleanly cut. Again, EB Industries had capabilities in-house to advance the new bus bar design quickly. We have an array of high powered continuous wave lasers which operate on exceptionally fast cycle times, allowing rapid prototyping and smooth transition into full production. More importantly, these state-of-the-art high-speed laser cutting systems have advanced automation capabilities. Our customer basically emailed us digital models of the new bus bar, which we “drag and dropped” right into a specialized cutting program. The result was that iterations of the part happened in minutes rather than days or weeks. Imagine sending a digital model via email and seeing test results in the reply email. An added future benefit is that EB’s technology can laser cut in three dimensions. This means bus bars can be cut after forming, which has cost advantages as well as allowing the design of ever more complex configurations and form factors. This particular collaboration might seem serendipitous: A company found us and we happened to be a good fit. It is, however, more a story of preparedness than luck. EB Industries is in many ways a collaborative engineering firm, with the staff, labs, equipment and experience to contribute significantly. Product development often involves an iterative process where design decisions to meet specific requirements have a large impact downstream. Welding in particular can prove either a drastic disruptor or the finishing touch on the final form, fit, and function of a part. Knowing this, EB Industries has designed our operations to make sure that knowledge and expertise are provided early and often during customers’ design, development, and production cycles. Our engineers are available anytime for a phone consultations, they’re engaged during quoting as well, and act as program/project managers during development. Finally, engineers are part of our production operations such that if a situation does arise it can be resolved quickly. And behind everything we do is a commitment to making sure our customer is a hero to their customer.